A few years ago I missed out on buying a LEGO Technic crane and have been eager to build one ever since. There was a small crane released since then, but it wasn’t really appealing. The new 42009 crane that came out earlier this year – now that’s the crane I’ve been waiting for. This set has 2606 pieces that are separated into 3 sets of bags. There are 15 bags of parts for stage 1, 5 bags for stage 2, and 4 bags for stage 3. There are 6 instruction booklets. Yes, this is a large model. The set is rated for the 11-16 year old age group, but there are so many parts, and the set is a bit costly, that I wouldn’t be surprised if more adults built the crane than kids. Overall, the crane wasn’t difficult to put together, but there were a few challenging steps that tried my patience. It was an enjoyable and lengthy build, and the result is a fantastic motorized crane. The crane is nearly 23″ long, over 8″ tall, and about 5″ wide, so make sure you have enough shelf space to display the finished model. This set included a couple of new LEGO pieces I hadn’t seen before, but I don’t anticipate taking the crane apart for parts anytime soon. Some of the motorized functions, such as the outriggers, are a bit slow. While I wish the turntable was motorized as well, I cannot imagine how much more complex that would have been. To motorize the turntable gearing would have required a separate motor and there’s no real place another motor and added gearing could have fit. 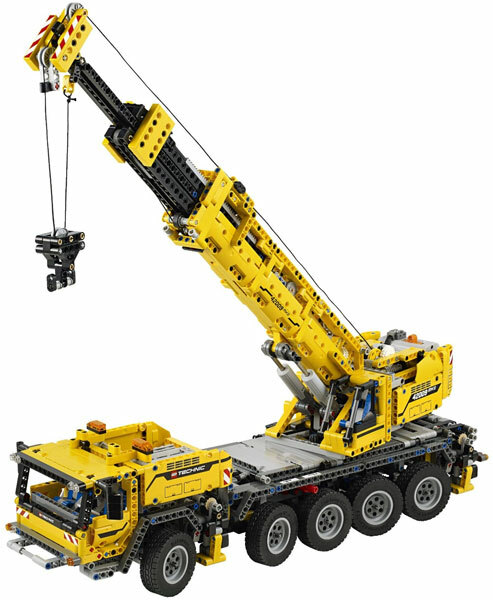 If you enjoy building LEGO technic construction vehicles, don’t pass this one up. If you do, you might end up waiting years for the next revision to come around, as I had.